As I’ve done in the past (you have looked into the Year’s Best category listing to the right I take it), I won’t be re-reading stories previously reviewed on Best SF, just referring back to the original review. So what of this handsome volume, covering both SF and fantasy? Originally in : Eclipse 2, ed Jonathan Strahan. As you expect from Chiang, an inventive and expertly crafted tale. He smoothly posits a humanity in which lungs are replaced when empty of air, in a society constrained within a finite dome. What is not finite, in fact, is the oxygen which they breathe, and we follow one scientist as he explores the nature of their reliance on oxygen, and the implications of a supply that will not last much longer. One to be instantly re-read to savour the quality. And if you like short SF, and don’t have a copy of Chiang’s ‘Stories of Your Life’ collection, then I would suggest you rectify that situation. Peter S. Beagle. Uncle Chaim and Aunt Rifka and the Angel. A young Jewish boy observes the impact a visiting angel has on his artist Uncle Chaim. The angel has been sent as a muse, and the relationship between the artist and the angel is an intriguing one. Matters come to a head, however, when a family friend, a rabbi, visits the studio and realises that a dark dybbuk is lurking within the angel. In offering the dybbuk an opportunity to leave the angel, the young boy enables that dark spirit to transcend to heaven – something of which, and about hell, that is revealed in the story. It’s a beautifully written story. Originally in : Extraordinary Engines. Originally in : Fast Forward 2. Bacigalupi explores the world of hi-tech internet media, through the eyes of someone working, but somewhat detached, from the hyper-obsessed American culture. One of the stars of his news gathering corporation gets a hot story and generates enough traffic to their site to guarantee bonuses all round. Having left a lot behind in his native Laos, Ong finds himself, instead of writing niche stories with low levels of footfall, he has a chance to hit the big time in being pitched in with a major celebrity from his home country and with, seemingly, a lot in common. However, it turns out that the celebrity has very much embraced the modern culture of the US, and he has to take a gamble on which route to take. Ian McDonald. The Dust Assassin. Originally in : The Starry Rift. MacDonald’s ‘River of Gods’ novel and the complementary short stories in the ‘Cyberabad’ sequence have been standouts for me in recent years, and here he gives full rein in a story that is a more of a full adult story than a YA story. It features a young woman in one of two families who own major water companies in India, whose family is wiped out by the other in one awful night. However, her future has been mapped out for her, with one of the neuters who feature in these stories, pulling the strings. Originally in : Magic in the Mirrorstone. Short urban fantasy in which a young girl living rough on the streets is enraptured by a young man she meets. He’s living out near the zoo, and he eventually unburdens her with his story, and the unicorn that lives in the woods. Its an unrequited love, but after his departure, the girl is haunted by the absence of the faerie. John Kessel. Pride and Prometheus. The two unmarried Bennet daughters, Mary and Kitty, are in London, the younger, prettier, out to catch herself a man, like Mr Darcy, of some six thousands pounds per year. However, it is Mary who is smitten – by Mr Frankenstein. The creature also lurks, and the story leads a leisurely pace until a dreadful denoument, when young Kitty dies of a fever, and her body is resurrected by Frankenstein, to furnish the creature with a mate. Actually, this is a false denouement, as we find through means of a newspaper clipping a year hence, of the likely fate of several of the characters, although this rather wraps up the story post-haste and with less satisfaction than one would like. Paul McAuley. The Thought War. Originally in : Postscripts #15. Post-zombie-apocalypse, with one of the survivors relating the slow encroachment of the zombie invasion, and postulating a more scientific and much bigger picture rationale. Garth Nix. Beyond the Sea Gates of the Scholar Pirates of Sarskoe. Originally in Fast Ships, Black Sails. Originally from a piratical fantasy collection, Nix has some interesting backstory underpinning an assault on a seemingly impregnable fortress. There is treasure to be had, but Hereward and his small magically animated puppet, Mr Fitz, have another reason – the removal of an unauthorised godlet. There’s a cannibalistic half-leopardess pirate, lots of swashbuckling, cthulhian monsters in the deep, and a sense of it being but one adventure in the life of its protagonists, and clearly a closer link to space opera than you might think, me hearties. Originally in : Eclipse Two, ed Jonathan Strahan. Baxter has produced a number of shorter stories in recent years, memorably looking at a variety of means by which humanity comes to an end in the near future, subtly blending the technical background with its impact on a small group of people. The story references the potential impact on mathematician Turing on two young boys, who each grow up to be math whizzes. One is very much ahead of the other, albeit slightly further down the autistic spectrum path, and it is he who is able to make the scientific breakthrough to decode the messages from far-distant aliens that are being picked up on the far side of the moon. However, in taking the decision himself to run the program that is being delivered to us, he is opening up Pandora’s Box. The reason behind the nature of the ‘gift’ being delivered is one that has a truly galactic spanning backdrop. Originally in : Fantasy and Science Fiction, October/November 2008. Originally in : Fantasy and Science Fiction, April 2008. A very strong story from Reed – it could in fact be mistaken as a Gene Wolfe. The only irritant for me is that the title isn’t going to lodge my mind as being ‘the story in which one man makes some major sacrifices, and sacrifices others, many others, for the greater good, in a story which spans time, what is is to be human, and, in the end, the virtual annhilation of the human race, as he, the last President urges those few remain to keep the light burning to wreak a revenge on those who have brought us to near extinction’. A rural English village is somewhat perturbed by some displaced goblins decamping on a farmer’s field. originally in : Fantasy & Science Fiction, June 2008. Originally in : Asimov’s Science Fiction, July 2008. Rachel Swirsky. Marry the Sun. Originally in : Fantasy Magazine, June 2008. Bridget backs out of her wedding at the lost moment, on account of her husband-to-be setting fire to her wedding dress. Problem is that he’s a Greek god, god of the sun, no less. and these god/human relationships are tricky things. Originally in : Interzone, April 2008. Back to the SF. Huzzah! It’s Greg Egan, which is good. And it’s Egan and good form, which is even better news. He follows one driven scientist whose discovery of a means of creating computational power previously only dreamt of, enables him to explore the limits of just what can be created inside silicon. He creates powerful simulations, in which the building blocks of life are created, and in which he encourages his creations to develop sentience through setting environmental challenges. The processing power enables him to develop sophisticated creatures quite rapdily, but this does require him to play god with those he creates, discarding those headed into evolutionary dead-ends. Fortunately, he is able to recognise the point at which those which he has created are sentient enough to feel sadness, and then it becomes more of a challenge, encouraging them to grow thorugh direct intervention. As his creations develop apace it becomes clear that he has succeeded beyond his wildest dreams, although a nightmare unfolds as they are able to make the leap from creatuers living in a computer simulation to ones which can manipulate the world outside. Hannu Rajaniemi. His Master’s Voice. Originally in : Interzone, October 2008. Rajaniemi impressed with the only other story of his I read – Deus ex Homine in the excellent collection ‘Nova Scotia’. Here he is similarly hi-tech, with a POV character of an enhanced dog which, along with feline support, makes a daring raid to rescue their creator from the lengthy incarceration imposed as a result for his transgressive cloning experiments. Maureen F. McHugh. Special Economics. Originally in : The Del Rey Book of Science Fiction and Fantasy, ed Ellen Datlow. McHugh does for near future hi-tech China what Ian McDonald has done for near future hi-tech India. She looks at indentured labour, as a young girl takes a job for a hi-tech city firm, only to find that the money she earns doesn’t cover her keep. She uses her street-cunning, and a fortuitously quick bus journey, to take advantage of a government agent, to redress the balance in favour of her fellow employees. Originally in : Asimovs, February 2008. Originally in : Fantasy & Science Fiction, February 2008. Ken Scholes. The Doom of Love in Small Places. Neat little love story set in a broken, bureaucratic post-something society just a little skew-whiff. The journey from the fifth floor to reception is one that takes weeks, but the beautiful Miss Sketteron and Drumm, somewhat surprisingly, get along well. And despite him hoarding a little bit of love, to keep her with him, love flourishes. Originally in : Pretty Monsters. Strahan closes off his Volume 3 with a very classy story by Kelly Link, although if you were pedantic you would say it was horror rather than fantasy. It’s cleverly structured, with two stories having their narratives entwined – until the end, when a third, meta-perspective concludes the stor(ies). Inasmuch as the stories are concluded, as the endings are left to the reader. The opening, initial narrative features a young girl who sleepwalks her way into danger, going out into the ocean and being caught in a riptide, only saved by a surfer dude. She falls in love with him, a love unrequited, and indeed, rebuffed over the years. To make matters worse, his sister marries her uncle. However, there is more to him than meets the eye, as we are forewarned in the other narrative, whose characters are reading this story. The other narrative features a group of teen girls, the ‘Pretty Monsters’ of the title, as one of the gang of friends submits to an initiation ceremony that each has to go through. Each ceremony – they call it an ‘ordeal’ – is different, and this young girl has the misfortune to have her ordeal planning by a girl who has taken dislike to her mother, and who therefore intends the ordeal to be as big for the mother as her daughter. Both narratives are handled beautifully, the relationships between the characters, the family members, all believable and engaging. As the stories progress, the themes of identity and persona, and hidden secrets gradually become increasingly clear, with mounting lycanthropic horror, although that horror is always off-stage. A collection of excellent stories. The fantasy stories are very much of the urban contemporary manner, which is fine by me, as if I have to read fantasy I’m much rather read this type than fantasy featuring wizards and quests. On the SF side, perhaps less of the far-future and/or space opera than I’d like to see, but quality writing. Kelly Link. Pretty Monsters. 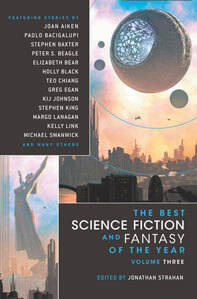 (The Best Science Fiction and Fantasy of the Year, Volume 3). Tobias S. Buckell. A Jar of Goodwill. (Clarkesworld Magazine May 2010). 4 Responses to Jonathan Strahan. The Best Science Fiction and Fantasy of the Year. Volume 3. Have you thought about giving away fewer plot points when talking about the stories? I think you probably ruined quite a few I haven’t read. I am so glad to see that Paul McAuley is in this. He’s an intensely imaginative writer and a real treat to chat with. (He even did an interview with me recently.) What a guy! Jeff – thanks for the contribution. I did put up a spoiler alert on a review of a new Clarkesworld story yesterday, routing people through to read the online story before reading the review. I would hate to ruin anyone’s reading of the stories, but would hope that visitors to the site would realise quickly the nature of the review, and perhaps then limit themselves to reading the short summary with each volume, and/or skipping to the conclusion. But I’ll give some thought to your suggestion.